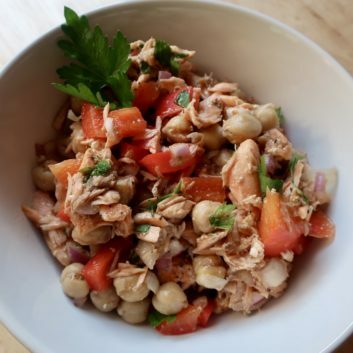 Everybody seems to have a favorite tuna salad recipe, but it is just as easy to create fabulous salads using canned salmon, which has much more omega-3 fats and vitamin D. Serve over a bed of lettuce or in a sandwich with whole wheat bread. In a medium bowl, mash the salmon. Mix in the chickpeas, onion and red pepper. In a separate bowl, whisk together the oil and vinegar. Season with preferred herbs and spices. Pour the dressing over the salmon mixture and stir thoroughly. Cover and refrigerate up to 2 days.